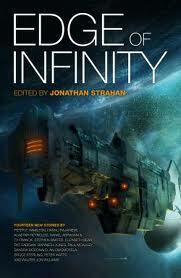 Almost as thrilling as the news that Pat Cadigan has just won the Hugo Award for her novelette "The Girl-Thing Who Went Out forSushi" from the anthology Edge of Infinity, is the realization that this is Pat's first Hugo. Well-deserved, and damned well-earned! As hard to believe as that is, it's equally hard for me to believe that her career now extends more than a third of a century , back to her first stories in fan publications. Her career, like most writers' careers, has had its ups and downs, but the trajectory of that career -- always a different thing from the temporal reality of any writer's career -- has remained in the ascendant. That she was -- and is -- a writer of large ambition has been clear from the moment, in the early '80s when her "Deadpan Allie" stories began to appear, although it was probably her "Pretty Boy Crossover" that really began her breakout from new writer to major writer. No mistaking that voice and what it had to say -- there was a writer in the room. 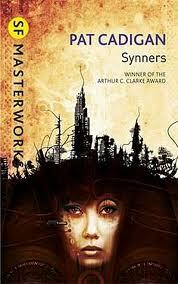 That second novel, Synners (1991) pushed cyberpunk -- and then some -- in half a dozen simultaneous and simultaneously different directions, a huge leap in both craft and art over Mindplayers, and a major novel by any standards, not just those of cyberpunk.There was not a more complex, or more complexly provocative SF novel in the 1990s. It is the richest of her novels so far. Approaching and then entering the new century/millennium, Pat Cadigan began ringing changes, some subtle, some audacious, on her explorations of virtual lives (and deaths) and virtual responsibilities, not to mention the nature of the virtual world's effects on the real world we were increasingly using our virtual connections to distance ourselves from. Her set of matched novels, Tea From an Empty Cup (1998), and Dervish is Digital (2001), marries -- and consummates the marriage! -- of cyberpunk with procedural noir. The novels have a gritty reality and an even grittier virtual reality. They deserve to be better known than they are. Caveat (sorta): I am one of the dedicatees of Tea, which doesn't affect at all the esteem with which I regard that novel. Throughout all of this, too, Pat has continued to produce a body of short fiction that is among the very best of her generation -- and any other for that matter. 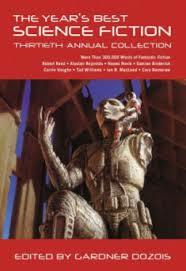 Her stories continue to be highlights of the magazines and original anthologies in which they appear, as they are of the best of the Year anthologies they also inevitably (well, almost inevitably) appear in. Nine decs into her second hitch Fry hit a berg in the Main ring and broke her leg. And she didn't just splinter the bone -- compound fracture! Yow! No mistaking that voice either -- it's Pat Cadigan's.